Radiation damage and protection levels are based on “Reference Man,” a healthy, white male in the prime of life, and mostly ignore the more vulnerable fetus, growing infant and child, the aged, those in poor health, and women who are, according to the National Academy of Sciences (NAS) 37- 50% more vulnerable than adult men to the harmful effects of ionizing radiation. These levels do not take into account the far greater vulnerability of women and children, especially pregnant women and unborn children. A panel from the U.S. National Academy of Sciences charged to investigate the dangers of low-energy, low-dose ionizing radiation has concluded, “that it is unlikely that a threshold exists for the induction of cancers… (BIER VII, 2005)” and these levels are cumulative. Therefore, saying that there can be a “safe” level of radiation exposure is simply wrong. There is no guarantee that even the smallest doses of radiation will not cause harm. Radiation treatment for cancer may increase risk for new cancers later in life. The report Second Cancers Caused by Cancer Treatment, American Cancer Society, January 31, 2012, discusses the risk of some cancer treatments, such as chemotherapy and radiation therapy, increasing a person’s risk of developing a different type of cancer later in life. The human body is born with potassium-40 in its tissues and it is the most common radionuclide in human tissues and in food. We evolved in the presence of potassium-40 and our bodies have well-developed repair mechanisms to respond to its effects. The concentration of potassium-40 in the human body is constant and not affected by concentrations in the environment. The nuclear industry tries to compare the safety of radiation in bananas to the safety of other types of radiation. This is a false argument. Unfortunately, nuclear workers and others have been given this false education about radiation. Ionizing radiation (the type released from nuclear reactors) travels through our living tissue with much more energy than either natural chemical or biological functions. This extra energy tears mercilessly at the very fabric of what makes us recognizably human—our genetic material. Elderly and people with immune disorders are more susceptible to ionizing radiation. Women are more susceptible to this damage than men and children more susceptible than adults. Children and the unborn are especially susceptible because of their rapid and abundant cell division during growth. Female children are the most susceptible. Recent French and German studies indicate higher rates of leukemia for children living near nuclear power plants. The well respected 2007 German KiKK study found children under age five living near nuclear power plants had over twice the normal rate of leukemia. See Table V and chart below. Over twice the normal rate (2.19) if they lived within 3.1 miles (5 km). 1.33 times the normal rate if they lived within 6.2 miles (10 km). KiKK German Study: Estimated dose response curve for leukaemias (upper curve) based on conditional logistic regression model (593 cases, 1,766 matched controls; distance axis cut off at 50 km). Lower curve: estimated lower one-sided 95% confidence band. Dotted lines: categorical results for inner 5- and 10-km zone. Cancers linked to ionizing radiation exposure include most blood cancers (leukemia, lymphoma), lung cancer, and many solid tumors of various organs. Heart ailments are also associated with radiation exposure. A living being’s genetic material is the library that houses the instructions for many important aspects of that being and his or her offspring including the ability to defend against a myriad of diseases. If we allow ionizing radiation to tamper with our genes, it could cause irreversible damage, not just to this generation through cancer, but to future generations through gene mutations and ensuing disease. The health consequences of the April 26, 1986 Chernobyl nuclear disaster are continuing. See this important video on the health consequences of Chernobyl and how the International Agency for Atomic Energy (IAAE) is involved in suppressing the information. The U.S. Department of Health and Human Services (HHS) recommends distribution of Potassium iodide (KI) to individuals residing within 10 miles of a nuclear plant. However, the American Thyroid Association (ATA) recommends that KI distribution not be limited to 10 or 20 miles. No one can predict how far a radioactive iodine cloud might spread. After Chernobyl, higher than expected rates of thyroid cancer were found more than 200 miles away from the nuclear plant. Thus, no one can predict how far from a nuclear plant the U.S. should distribute KI if it is to protect every person who might be exposed to radioactive iodine. The American Thyroid Association recommends three levels of coverage, determined by distance from the nuclear plant. > 200 mi Make KI available from HHS National stockpile. Do not take KI tablets unless instructed. KI can have side effects. KI cannot protect from other radiation health risks. Beyond Nuclear has a campaign to make the recommendations of the American Thyroid Association a requirement for emergency planning and preparedness around US nuclear power plants. For more information, go to Beyond Nuclear’s Got KI? campaign web page. Like normal hydrogen, tritium can bond with oxygen to form water. When this happens, the resulting water (called “tritiated water”) is radioactive. Tritiated water (not to be confused with heavy water) is chemically identical to normal water and the tritium cannot be filtered out of the water. Tritium is almost always found as tritiated water and primarily enters the body when people eat or drink food or water containing tritium or absorb it through their skin. People can also inhale tritium as a gas in the air. Tritiated water is the most abundant chemical form of tritium in the environment. When tritiated water enters the body it acts just like normal water, spreading throughout the body and delivering a uniform radiation dose to all soft tissues. … it takes about 10 days for half the intake or uptake of tritiated water to be discharged out of the body. This period is called the biological half life. Health risks are associated with exposures to tritium through inhalation, ingestion of tritium gas (HTO) or organically bound tritium (OBT), or absorption of tritium gas through the skin. The health effects of ionizing radiation are proportional to the energy carried by the radiation and delivered to living cells. Organically bound tritium (OBT) forms when organic molecules are exposed to tritium gas (HTO). This could happen in the human body or through uptake of HTO by plants. OBT (e.g., from garden vegetables) has a different metabolism than HTO and can be retained in the body for somewhat longer periods. The biological half-life is on the order of 48 days. Tritium has a radioactive half life of 12.3 years. When tritium undergoes radioactive decay, it is transformed into nonradioactive helium through emission of a beta particle from its nucleus. Tritium’s beta particles have a very low penetrating ability, not enough to penetrate skin. Therefore, tritium primarily enters the body when people eat or drink food or water containing tritium or absorb it through their skin. People can also inhale tritium as a gas in the air. The International Agency for Research on Cancer (IARC) has determined that radioactive strontium [e.g., SR-90] is carcinogenic to humans, because it is deposited inside the body and emits beta radiation. The EPA has determined that radioactive strontium is a human carcinogen. Aside from the stable isotopes, strontium has twenty-two radioactive isotopes most of which have a half-life of less than 1 hour. The longest lived radioactive isotope is Sr-90 which has a half-life of approximately 29 years. 89Sr and 90Sr are formed during nuclear reactor operations and explosions (WHO 2010) making it likely to observe 90Sr near Department of Energy sites in the United States. How can strontium enter and leave my body? How can strontium affect my health? 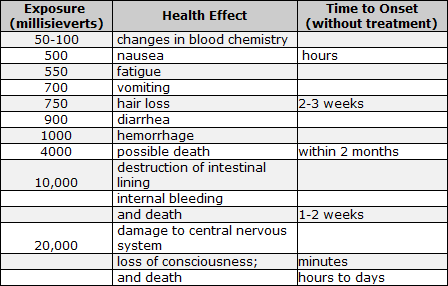 The harmful effects of radioactive strontium are caused by the high energy effects of radiation. Since radioactive strontium is taken up into bone, bone itself and the soft tissues nearby may be damaged by radiation released over time. Because bone marrow is the essential source of blood cells, blood cell counts may be reduced if the dose is too high. This has been seen in humans who received injections of radioactive strontium (89Sr) to destroy cancer tissue that had spread to the bone marrow. Lowered blood cell counts were also seen in animals that breathed or swallowed radioactive strontium. Numerous problems occur when the number of blood cells is too low. A loss of red blood cells, anemia, prevents the body from getting sufficient oxygen, resulting in tiredness. A loss of platelets may prevent the blood from clotting properly, and may result in abnormal bleeding, especially in the intestines. A loss in white blood cells harms the body’s ability to fight infectious disease. Radioactive strontium may cause cancer as a result of damage to the genetic material (DNA) in cells. An increase in leukemia over time was reported in individuals in one foreign population who swallowed relatively large amounts of 90Sr (and other radioactive materials) in river water contaminated by a nuclear weapons plant. Cancers of the bone, nose, and lung (in the case of a breathing exposure), and leukemia were reported in animal studies. In addition, skin and bone cancer were reported in animals that received radiation at high doses to the skin. Is there a medical test to show whether I’ve been exposed to strontium? All people have small amounts of stable [non-radioactive] strontium in their bodies. There are tests to measure the level of strontium in blood, hair, feces, and urine. These tests are most useful for people exposed to high levels. These tests cannot determine the exact levels of strontium you may have been exposed to or predict how the levels in your tissues will affect your health. Uranium is an emitter of ionizing radiation, and ionizing radiation is carcinogenic, mutagenic, and teratogenic (birth defects, miscarriages). The primary noncarcinogenic toxic effect of uranium is on the kidneys. Water from the Colorado River, a major source of Metropolitan Water District of Southern California’s water, generally has 4 picocuries of uranium per liter. The five largest community water agencies in Orange County report uranium levels of 1.9 to 9.4 picocuries per liter, on average. The U.S. Environmental Protection Agency (U.S. EPA) has established a maximum contaminant level (MCL) for natural uranium of 30 μg/L (ppb), based on a cost-benefit analysis (U.S. EPA, 2000). The U.S. EPA maximum contaminant level goal (MCLG) is zero. The State of California has an MCL for uranium of 20 pCi/L based on earlier studies of toxicity to the kidney in rabbits. The kidneys and bones are the principal sites of accumulation and toxic action of uranium. Following uranium administration, 80 percent is excreted in urine and feces, 10 percent is deposited in the kidneys and the remaining 10 percent is deposited in the skeleton with negligible concentrations appearing in other tissues (e.g., liver, lungs). The skeleton is the major site of long-term storage of uranium. The intake of depleted uranium can be determined from the amounts excreted daily in urine. Depleted uranium levels are determined using sensitive mass spectrometric techniques; in such circumstances it should be possible to assess doses at the mSv level. May 4, 2016 (HealthDay News) — There appears to be a strong link between exposure to high levels of radon in the home and women’s risk of hematologic malignancies, according to a study published online recently in Environmental Research. The American Cancer Society collected information over 19 years on 140,652 Americans. 3,019 incident hematologic cancer cases were diagnosed. The cancers included leukemia, lymphoma, and myeloma. Women who lived in counties with the highest radon levels were 63 percent more likely to develop hematologic malignancies than those in counties with the lowest radon levels. There was no link seen among men. The study authors said further research is needed to learn more about the link between radon and hematologic malignancies, and whether women actually have a higher risk than men. The severe incident of Fukushima Daiichi Nuclear Power Station has caused radioactive contamination of environment including drinking water. Radioactive iodine, cesium, strontium, barium and zirconium are hazardous fission products because of the high yield and/or relatively long half-life. Abstract: In the present study, 4 pot-type water purifiers and several adsorbents were examined for the removal effects on these elements from drinking water. Iodide, iodate, cesium and barium were removed by all water purifiers with efficiencies about 85%, 40%, 75-90% and higher than 85%, respectively. These efficiencies lasted for 200 l, which is near the recommended limits for use of filter cartridges, without decay. Strontium was removed with initial efficiencies from 70% to 100%, but the efficiencies were slightly decreased by use. Zirconium was removed by two models, but hardly removed by the other models. Synthetic zeolite A4 efficiently removed cesium, strontium and barium, but had no effect on iodine and zirconium. Natural zeolite, mordenite, removed cesium with an efficiency as high as zeolite A4, but the removal efficiencies for strontium and barium were far less than those of zeolite A4. Activated carbon had little removal effects on these elements. In case of radioactive contamination of tap water, water purifiers may be available for convenient decontamination of drinking water in the home. a. Leukemia. [Chronic lymphocytic leukemia (CLL) is excluded]. The onset is to have occurred at least two years after initial exposure at any covered facility during a covered time period. d. Primary or Secondary Renal Cancers. (2) Lymphomas (other than Hodgkin’s disease). Waldenstrom’s macroglobulinemia is considered to be a type of non-Hodgkin’s lymphoma. From 10/15/2013 San Clemente Nuclear Waste symposium. Amy Berrington de González, D.Phil, is a senior investigator at National Cancer Institute and has done numerous reports on the cancer risks of radiation. Much of her research is referenced in the above report. Click here to see her biography and links to her studies. Rocketdyne workers at the Santa Susana Field Laboratory (SSFL) in California show significantly higher rates of cancer. See Epidemiologic Study to Determine Possible Adverse Effects to Rocketdyne/Atomics International Workers from Exposure to Ionizing Radiation, UCLA School of Public Health, June 1997. Blood and Lymph System Cancer: All available evidence from this study indicates that occupational exposure to ionizing radiation among nuclear workers at Rocketdyne/AI has increased the risk of dying from cancers of the blood and lymph system. Lung Cancer: Exposure to external radiation appears to have increased the risk of dying from lung cancer. Upper Aerodigestive Tract Cancer: Results of this study strongly suggest that exposure to internal radiation has increased the risk of dying from cancers of the upper-aerodigestive tract. Age Affect on Cancer Type: While the estimated effects of external radiation on total cancers, radiosensitive solid cancers, and lung cancer were largest for doses received after age 50, the estimated effect on hemato- and lymphopoietic cancers was largest for doses received before age 50. Steven Starr, Senior Scientist, Physicians for Social Responsibility, Clinical Laboratory Science Program Director, University of Missouri. Presented March 11, 2013 at the Helen Caldicott Foundation Symposium: The Medical and Ecological Consequences of the Fukushima Nuclear Accident, March 11th & 12th, 2013, New York City. Video by Cinema Forum Fukushima, HD 21 min 10 sec. See other symposium presentations. Dr. Ernest Sternglass discusses the dangers of exposure to even the lowest doses of radiation and how his work evolved based on the scientific findings of Dr. Alice Stewart. He talks about how his scientific work led to President John F. Kennedy calling for a ban on atmospheric testing of nuclear bombs, and how Dr. John Gofman’s important work on the increase of childhood cancers and leukemia was attacked by the nuclear power industry. Dr. Ernest Sternglass was Professor Emeritus of Physics at the University of Pittsburgh. He was Co-founder and Director of the Radiation and Public Health Project (www.rphp.org), and author of “Secret Fallout: Low-Level Radiation from Hiroshima to Three Mile Island”. Dr Sternglass has extensively studied and published on the public health effects of atomic bomb testing and nuclear reactors. As an activist, he organized and campaigned vigorously on the effects of low-level radiation exposure. The work of Stewart, Gofman and Sternglass led to scientists worldwide accepting the linear non threshold model of health and radiation exposure. In the 1950s, Major Hank Henry was one of the top fighter-bomber pilots in the United States Air Force, and a member of the 4925th Test Group (Atomic). At the group´s 1986 reunion, he mounted one of “his” nuclear weapons, the casing for a 500-kiloton atomic bomb, on display at the National Atomic Museum. Learn more about the health impacts from the nuclear fuel cycle (uranium mining and processing, and nuclear power and bombs) in this photo essay by James Lerager, Nuclear History, Nuclear Destiny. Irradiation, in itself, will never be a food safety program. There is much yet to learn about the effects of moderate dosage irradiation on fruit and vegetable microbiology and physiology. Until we learn more, we would do well to continue to rely on strong food safety programs to prevent contamination of our products rather than to believe that we can fix the problem after it has happened. What Foods Have Been Approved for Irradiation? FDA requires that irradiated foods bear the international symbol for irradiation. Look for the Radura symbol along with the statement “Treated with radiation” or “Treated by irradiation” on the food label. Bulk foods, such as fruits and vegetables, are required to be individually labeled or to have a label next to the sale container. FDA does not require that individual ingredients in multi-ingredient foods (e.g., spices) be labeled. It is important to remember that irradiation is not a replacement for proper food-handling practices by producers, processors and consumers. Irradiated foods need to be stored, handled and cooked in the same way as non-irradiated foods, because they could still become contaminated with disease-causing organisms after irradiation if the rules of basic food safety are not followed. Bulk or packaged food passes through a radiation chamber on a conveyor belt. The food does not come into contact with radioactive materials, but instead passes through a radiation beam, like a large flashlight. The type of food and the specific purpose of the irradiation determine the amount of radiation, or dose, necessary to process a particular product. The speed of the belt helps control the radiation dose delivered to the food by controlling the exposure time. The actual dose is measured by dosimeters within the food containers. Cobalt-60 is the most commonly used radionuclide for food irradiation. However, there are also large cesium-137 irradiators and the Army has also used spent fuel rods for irradiation. What are Allowable Dose Levels? 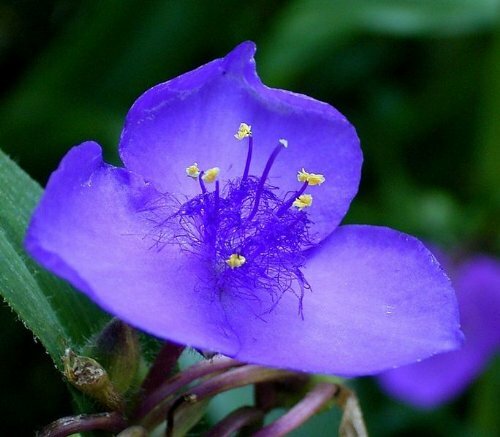 SUMMARY: Somatic mutation rates from blue to pink were studied in the stamen hairs of Tradescantia ohiensis KU 7 clone, a blue/pink heterozygote, exposed to 100 to 510 mR/hr gamma rays or to 12 mR/hr scattering radiation. The results obtained supported the previous finding of the sensitive genetic responses of this botanical system, demonstrating that the genetic effect could be detected with this system at a radiation level as low as 3.60 R total exposure (also possibly only 0.96 R) given at a low exposure rate of 12 mR/hr. Pooling the present and previous data, a somatic mutation rate of 3.88 or 3.43 X 10-4 pink mutant events per hair per R was obtained for gamma-ray irradiation during hair development. The somatic mutation rate calculated for scattering radiation was even higher than this (1.25 x 10-3). The doubling dose of the somatic mutations at the specific locus was calculated to be 13.8 or 15.6 R when irradiated with gamma rays during hair development, and the corresponding value with scattering radiation was 4.29 R. Lower doubling doses could be calculated based on published data from the stamen hairs of the same and three other Tradescantia clones irradiated more acutely. These low doubling doses seem to throw doubt on the safety standards of radiations. This blood test detects radiation dosages, accurately quantifying dosages of up to 5 Gray (the standard unit of measurement for ionizing radiation). Developed by University of Florida. This fact sheet does not mention the risk of inhaling radionuclide particles following an accident. Radioactive particulates can get caught inside your lungs and stay there for a long time. If I lived downwind of San Onofre, I would want to keep a suitable respirator with a HEPA filter rating handy. Also, I would keep an extra one in my vehicle for each occupant.